Tamika Catchings during this month’s match up with the Sparks in Los Angeles. Photo by Mark Hammond. Indianapolis, Ind. – Tamika Catchings is ready for her final regular-season home game and retirement ceremony Sunday, thanks to support from family and friends. The record-setting 15-year Indiana Fever veteran has seen a whirlwind season glide into a tight-knit close with the arrival of her entire family for the weekend, and her last two games at Bankers Life Fieldhouse before the team heads into the playoffs. Catchings said it means the world to her to be surrounded by her loved ones. 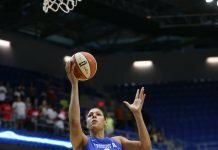 Never one to disappoint, Catchings became the league’s all-time rebounds leader in Friday’s game against the Minnesota Lynx, surpassing Lisa Leslie. In Sunday’s match up with the Dallas Wings, Catchings will lead Indiana in a bid for the fifth playoff seed. The intensity of the weekend matches that of the summer for Catchings, both on and off the court. She helped lead the Fever out of a slow season start before heading to the Olympics and winning a fourth gold medal with Team USA. 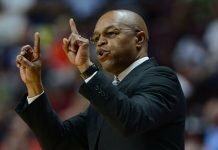 At the same time, she organized a “Legacy Tour” that served as a charity drive for both her Catch the Stars Foundation, and an organization in each WNBA city. That wrapped up just this past Tuesday. 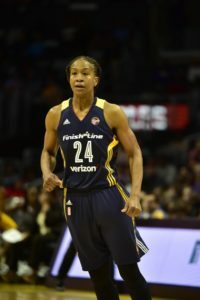 Tributes from WNBA players, coaches and others have been flowing steadily, but gestures from Indiana Pacer players have been among those that have touched Catchings the most. Forward Paul George bought 5,000 tickets to Indiana’s last game to give away to fans. George and several of his teammates also pitched in to collect $50,000 for Catch the Stars. “Love y’all and appreciate each of you so much!” Catchings said in an Instagram post with a picture of her and Pacers players – some of whom were wearing her Olympic medals. The Fever tip off against the Wings at 4 p.m. Eastern on ESPN2.